Make a neat little tea bag wallet to carry your favorite flavors with you. This is a guide about making a tea bag wallet. Holds 2 tea bags per pocket or 1 tea bag + sugar packet, yet small enough to fit into your purse. Recently, tea bag wallets were the big craze on eBay. I studied the photos on eBay and being the frugal person that I am wanted to find a free sewing pattern. So I searched the internet and couldn't find a sewing pattern and ended up making my own pattern out of interfacing and used a Sharpie permanent marker to mark the stitching lines. These are so easy to make. The wallet has 4 pockets and will hold a total of 8 tea bags. Open it measures about 7 1/2 inches long by 6 1/2 wide and closed about 3 1/2 inches all the way around. The sewing pattern measures 8 inches wide by 14 inches long and then I cut an extra piece for making the loop out of interfacing. You can make the loop as long or as short as you want it, just so it's long enough to loop around the button that is sewn on the front when finished. I used one piece of printed fabric for the outside and one piece of muslin for the lining. Take the printed fabric and the muslin, place right sides together and stitch a 1/4 inch seam on all 3 sides, making sure to square off corners. Leave the bottom open for turning. Then turn fabric right side out and press seams with a hot iron. Turn up bottom edge and stitch seam closed. Now you have the printed fabric on the top and muslin on the bottom. With muslin side facing you, fold up 3 1/4 inch on each side to make pockets. Place straight pins along the outer edge, pin fabric making sure edges are even. Stitch 1/4 inch all around tea bag wallet, making sure that you stitch in a loop for button placement. Now fold the fabric in half to find the center, and stitch a straight seam making 4 pockets. Close wallet and decide on button placement, open a pocket and hand sew on the button, making sure to not stitch the pocket closed. I also use my wallet to carry a tube of lip balm and a pack of gum in my purse. 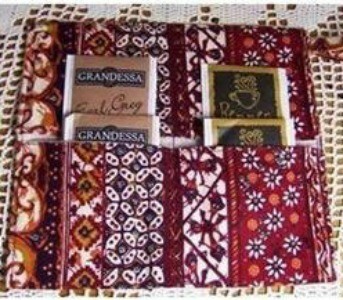 As a tea drinker, I like to carry the tea bags in my purse that I enjoy to drink especially when I am going to a restaurant or even to a party in someone's home, church or other functions. 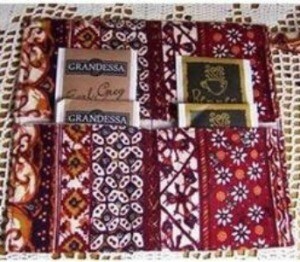 Tea parlors and tea gift shops are offering tea wallets to store tea bags in your purse. I recently discovered that if you can't find tea wallets at your local tea parlors or tea gift shops that you can substitute another "wallet" for tea. I found a pretty coin purse with handles on it and the tea bags fit in nicely. The coin purse will hold about 5 tea bags. Does anyone have instructions on making a tea wallet, for bringing your teabags with you? You could try this handy tutorial.